The American Haiku Archives advisory board is pleased to announce the appointment of Hiroaki Sato as the 2006–2007 honorary curator of the American Haiku Archives at the California State Library in Sacramento. This honor is in recognition of Sato’s service to haiku and related poetry through his translations, books, and writings about haiku. Sato was born in Taiwan in 1942 and educated in Kyoto, but has lived in New York City since 1978. His seminal anthology, From the Country of Eight Islands: An Anthology of Japanese Poetry, cotranslated with Burton Watson, won the PEN American Center translation prize for 1982. Among his most notable books focusing on haiku are One Hundred Frogs: From Renga to Haiku to English (Weatherhill, 1983) and One Hundred Frogs (Weatherhill, 1995). The first of these two books describes how haiku evolved from hokku and thus from renga, and firmly grounds haiku in the linked-verse tradition. The same book also explores renga and haiku written in English, demonstrating his direct support (unlike many other translators) for haiku written outside Japan. The second of these two books is a much shorter version of the first, presenting numerous translations of Basho’s famous furuike ya poem. Sato has also translated Basho’s Oku no Hosomichi as well as many other books of haiku, tanka, and other Japanese poetry, and That First Time is a collection of his own poetry that includes longer poems as well as several solo renga. Other books he has published over four decades are too numerous to begin listing here, but they show that his wide knowledge of Japanese literature and culture extends far beyond just haiku, giving readers an oeuvre that puts haiku into a larger context. Sato has also demonstrated his support for English-language haiku by serving as president of the Haiku Society of America for three years, from 1979 to 1981, and he has also spoken at Haiku North America and numerous other academic conferences. 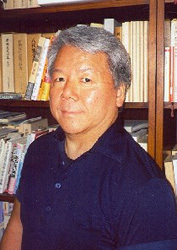 Sato’s term as honorary curator of the archives began for a year starting from July 12, 2006, the tenth anniversary of the founding of the American Haiku Archives. Takahashi, Mutsuo. Winter haiku: 25 haiku by Mutsuo Takahashi. Translated by Hiroaki Sato. Manchester, NH : First Haiku Press, 1980. From the country of eight islands: an anthology of Japanese poetry. Edited and translated by Hiroaki Sato and Burton Watson. Seattle, WA: University of Washington Press, 1981. Sato, Hiroaki. Haiku in English: a poetic form expands. Tokyo, Japan: Simul Press, 1987. Sato, Hiroaki. That first time: six renga on love, and other poems. Laurinburg, NC: St. Andrews Press, 1988. Ozaki, Hosai. Right under the big sky, I don't wear a hat: the haiku and prose of Hosai Ozaki. Translated by Hiroaki Sato. Berkeley, CA: Stone Bridge Press, 1993. Sato, Hiroaki. One hundred frogs. New York, NY: Weatherhill, 1995. Matsuo, Basho. Basho's Narrow road: spring & autumn passages. Translated from the Japanese, with annotations by Hiroaki Sato. Berkeley, CA: Stone Bridge Press, 1996. Santoka (Sochi Taneda). Grass and Tree Cairn. Translated by Hiroaki Sato. Winchester, VA: Red Moon Press, 2002.